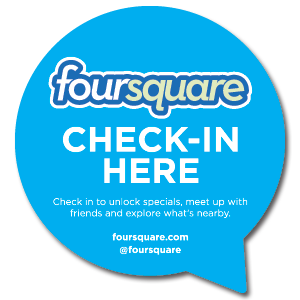 With over 20 million users, Foursquare is undoubtedly one of the most predominant platforms for mobile social media. It has always been a great way to see whose nearby or simply what your friends are up to. But until now, its lacked value in terms of what it can offer merchants. Until now, merchants could only promote specials via response to a customer’s check-in on the application. Foursquare has now rolled out new capabilities that enhance the experience of merchant-customer relationships. All of the features of the last version are still apart of the new version, but there are some spiffy new add-ons and updates. The first noticeable change is a merchant’s ability to reach out to customers in the area or customers who frequent their place of business. A merchant’s offers and promotions can now be delivered three ways – via check in, on a merchant’s venue page, or in the newsfeed of the individual if they are in the area. So how can your business use this to it’s advantage? Simple. Keep rolling out specials and updates a few times a week and share your fresh ideas with customers. Letting people know what you’re doing in your establishment or what new specials you are promoting, helps drive interest and spreads the word about your business – certainly a winning situation. Right now, all of these Foursquare features are free, but the company is rapidly expanding and looking to monetize its operation. Get involved now while you have time to learn about its benefits at the mere expense of spending time to learn the platform. Foursquare is working on being able to offer merchants a full set of tools to help them better identify their customer base and draw in new customers. The company admits they aren’t there right now, but they did note that they are steadily making progress on making their goals a reality. The next goal is to be able to make personalized offers to get the merchants directly engaged with specific customers (i.e. someone who is repeatedly giving you quality business). Right now it is unclear whether the idealized set of tools Foursquare wants to deliver to merchants in the future will strongly monetize the company, but as it stands right now your business will find benefits from using their new merchant services.